New York Classical Review was there when Gregory Kunde stepped up at 65 to make his first appearance in the house after a dozen years of exile. So how was it for them? Relief finally came in Act II. Gregory Kunde came in to replace Antonenko and gave a heroic performance in finishing the opera. At an astonishing sixty-five years old, Kunde still shows impressive body and caramel color in his voice, and boasts focus and weight at his top, even on the opera’s closing B-flat. He gave a touching reading of the Act III monologue, “Vois ma misère,” bringing a weariness into his characterization without losing any vocal power. If Antonenko is unable to resume the role, having Kunde sing the rest of the run would hardly be a disappointment. The Met should have had Kunde every season. The article makes two different statements about who will finish the run. Includes a couple of brief YouTube clips. 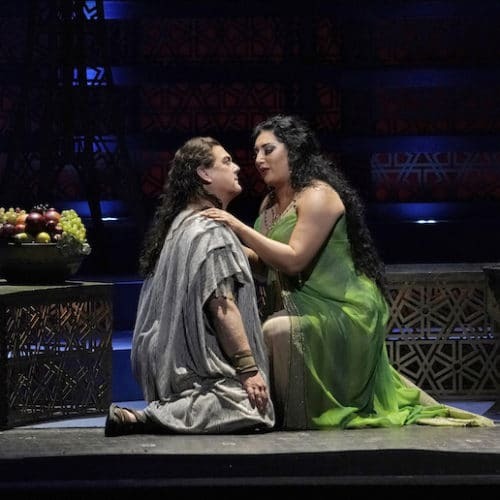 The Met announced late yesterday that Gregory Kunde will sing the performances on 3/16, 19 and 23. I am seeing it on 3/19. I am so glad Antonenko is not singing……. kunde sang as Otello at the Doge’s Palace in Venice in 2013, as Pollione in the Donizzetti’s Opera Norma in 2015, as Manrico in the Verdi’s Trovatore in 2014, as Vasco de Gama in the Meyerbeer’s L’africaine in 2013 and He was also for his first time the main Conductor of the Rossini’s Opera Il barbiere di Siviglia in 2018 for La Fenice Opera House Seasons.